While it may still feel like summer, fall is quickly approaching. 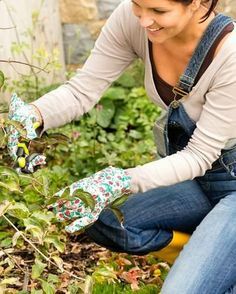 Organizing your autumn garden to-do list now will help you plan for all the things you want to accomplish before Old Man Winter shows his frosty face. Focus on clean-up and cover-up when coming up with your projects. Remove spent blooms and foliage – This will help prevent diseases and pests from overwintering in your garden. If you detect that a problem has already developed be sure to remove the affected debris from the area. Dig up bulbs and tender plants – If they cannot survive the cold temperatures, dig them up and move them indoors. Let your bulbs dry out on newspaper for a couple of days before putting them in paper bags to store in a cool, dry area. Mulch, mulch, mulch – Your summer mulch has started to decompose. Add a fresh layer of mulch to your beds now to keep weeds at bay. Replenish with another layer before harsh weather sets in to give you a thick protective covering for plants and soil. Rake up fallen leaves – Mulch the leaves with your lawn mower and spread them onto your beds or add the leaves to your compost pile. 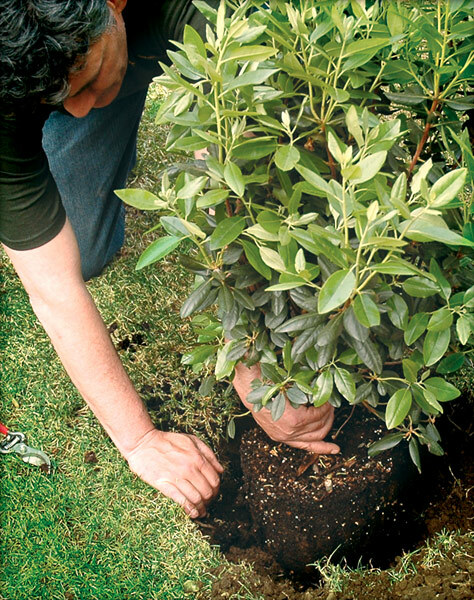 Continue watering trees and shrubs – Keep giving them deep soakings until right before the first frost. They need to build up moisture for the long winter months. Cut back perennials – Remove the dead portion of the plants to eliminate pests and mulch. Divide plants that have outgrown their spot in the garden. Till up beds – If your plants are all done for the season, remove the plant debris and till up your beds. When your vegetable garden has finished producing, till the plants into the soil. Add compost to beds – While tilling up your flower beds and garden, work some compost into the soil to help next spring. 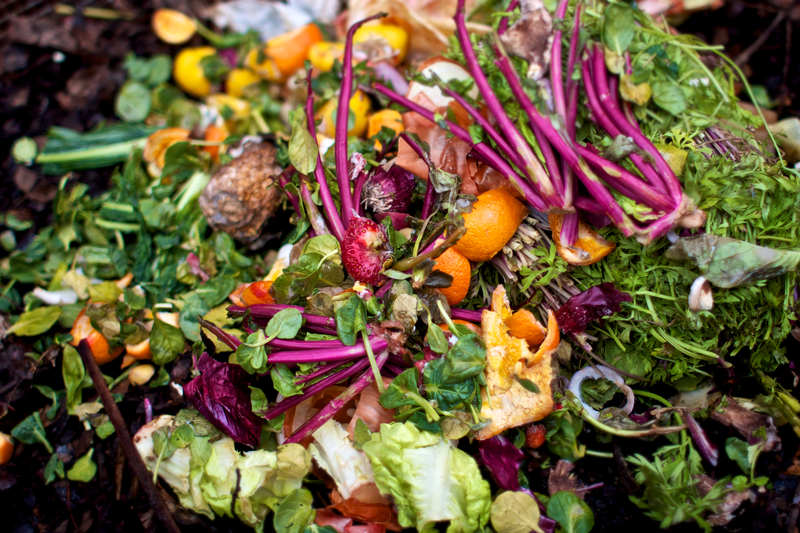 Maintain compost pile – Make sure your bins are ready to withstand the winter weather and that your pile has been amended so it will continue to decompose. 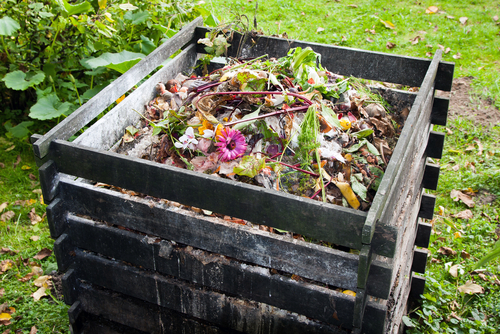 Cover the compost pile to keep it from getting too much rain and developing mold. Cover future flower beds – If you have an area you want to plant in the spring, till it up now, add organic materials and cover it with either a thick layer of mulch or plastic to discourage emergent growth. Hold off on trimming trees – Wait until your trees are dormant before you cut them back to avoid having any new growth appear before the first frost. While you are in the cleaning mood, don’t forget to clean your gardening tools before you store them for the winter. After washing them with soap and water, you may want to wipe them lightly with vegetable oil or WD40 to help keep them from corroding. Nothing beats a shiny new spade to work with in the spring! You’ll always be able to find a DIY project to do, which is why organizing your fall garden projects makes sense. It will help cut down on the workload in the spring. Be ready for Old Man Winter this year. Your garden will thank you for it. 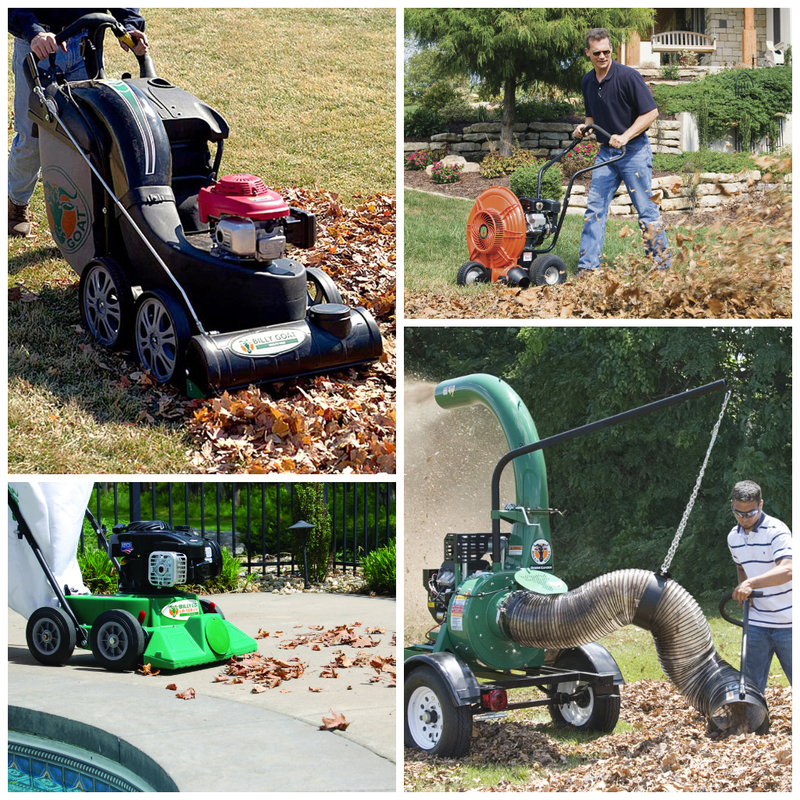 Our expert staff is always on hand to help you with your fall clean-up and maintenance projects. From rakes and shovels to wheel barrows and mulch, if you have any questions about what to choose, pricing or how-to’s, don’t hesitate to contact us. Stop by our store — we’re open seven days a week. 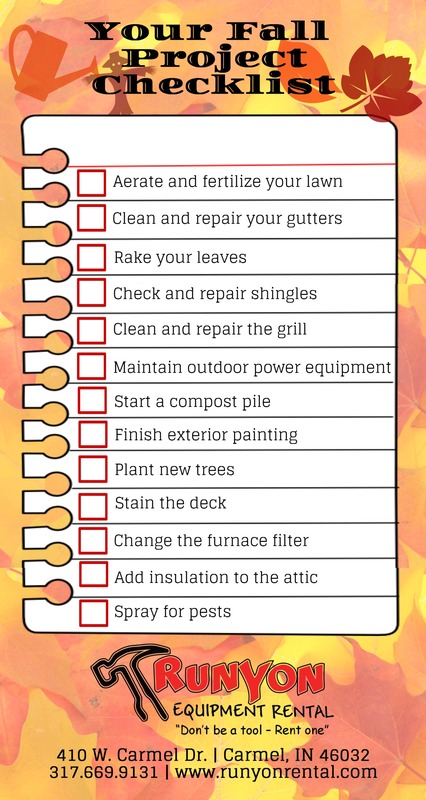 Check out our blog, Fall Checklist Part1- Garden Clean-up and Winterization for more helpful tips on getting ready for that lovely season we call winter. When planning projects to do around your house to get ready for the long winter to come, remember to include your garage. This often overlooked area is one of the main sources of heat loss in your home. Garages often share a wall with a kitchen or den. Keeping the garage warm will help keep your house toasty and more energy efficient. R-Value refers to an insulation material’s ability to resist heat flow. When insulating, the higher the R-Value, the better. 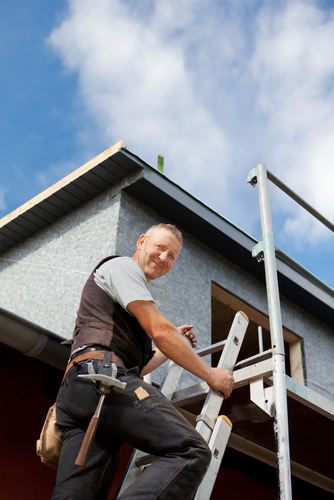 Normally for walls, look for an R-Value of R11-R15 and for an attic space, look for R38- R49. Foam board only has an R-Value of R3-R6, but is a good option for insulating garage doors. 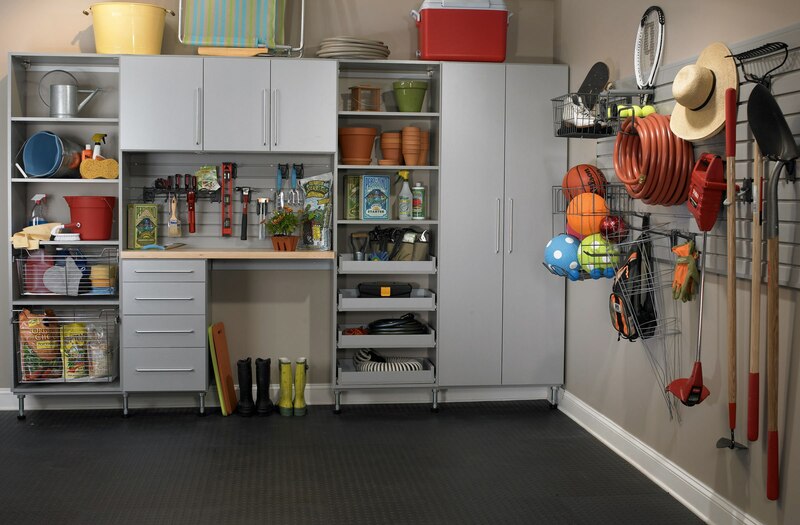 Assess your garage, and while you’re at it, why not organize and purge items that have accumulated over the summer. Look for any missed opportunities for storage in the rafters or along the walls. Work these features into your plan of attack for winterizing the garage. Cabinets along walls can do double duty, keeping the cold away from indoor rooms, as well as store items. Fix and insulate your garage door. Add foam board to the inside of your garage door. If you have an older door, consider investing in a modern insulated door. 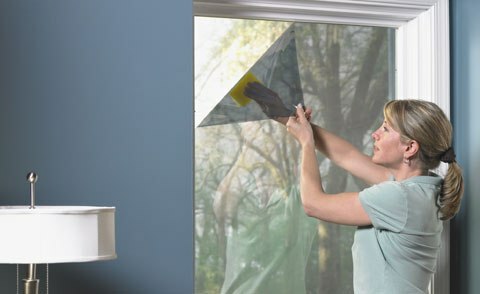 Replace weather stripping around your garage door and any outside doors. Insulate the garage walls. Garages are shells and have little if any insulation in the walls. Seal switches and outlets on outside walls. Cold air can seep in through these openings. Cover exposed pipes. It is easy to overlook these pipes, but treat them as if they are outdoors and wrap them. Caulk around any windows, doors and the garage door. The garage door is a big culprit for letting cold air in even when it is in place. Consider installing a weather seal where the door meets the ground. 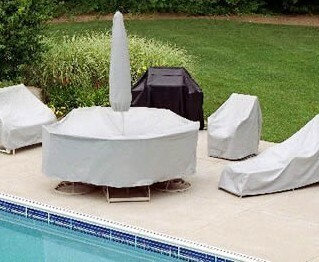 This will not only keep the frigid air out, but it will help keep rain and insects out, too. Waterproofing the floor of a garage will not only seal it to keep the dampness out, but it will also go a long way towards improving the appearance of your garage. Epoxy combines a resin and a hardener to form a rigid plastic material. These floors are easy to install. They are durable, repel stains and can stand up to heavy traffic. Epoxy is an affordable and stylish way to protect your concrete floors. Adding a heater may seem like a luxury, but it can help keep the fluids in your car’s engine from “gelling up”. A gas system will cost more to install but is cheaper to run. An electric unit will be cheaper to install but you will have higher operating costs. You’ll also be able to use your garage more in the winter using a heater, so you can work in a comfortable setting. 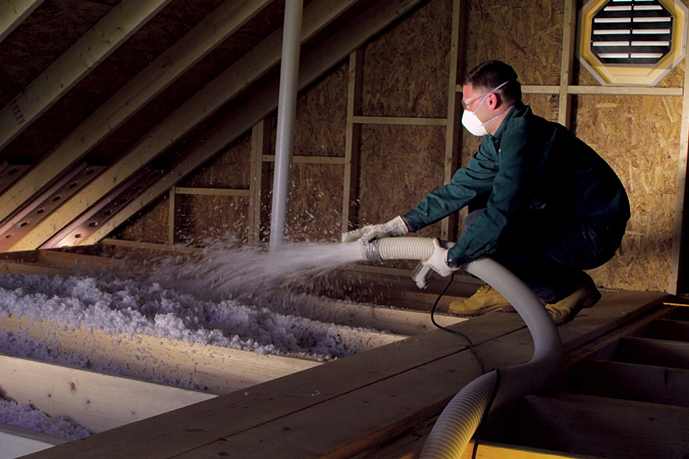 Insulating your garage now will help keep your heating costs down this winter. 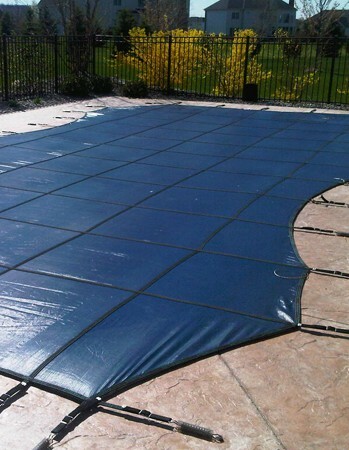 It will protect your car and other items in the garage from extreme temperature changes. Just think how nice it will be to get into your car without having to walk out into a cold garage. Bring on old man winter! 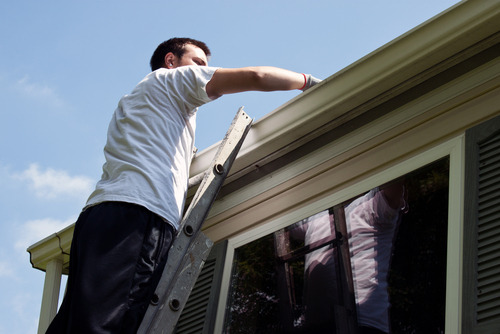 Our expert staff is always on hand to help you with your home improvement projects. From an insulation blower and epoxy mixer to a circular saw and drill, if you have any questions about what to choose, pricing or how-to’s, don’t hesitate to contact us. Stop by our store — we’re open seven days a week. Learn more insulation tips by reading our blogs, Increase the Energy Efficiency of Your Home by Insulating the Garage and Find Air Leaks in Your House and Plug ‘Em Up Fast. Has your lawn had its share of foot traffic this summer? With outdoor activities in full swing, it’s a sure bet your grass is a little stressed. It may be a toss-up as to which of you is more excited about the kids going back to school – you or your lawn! A little lawn pampering may be just the ticket. It will love you for it (and you will love how it looks next year). 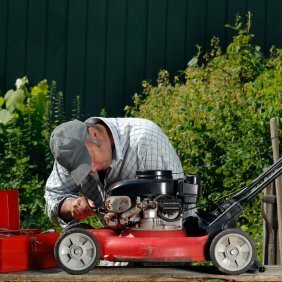 Once the summer heat is gone, lower your lawn mower to a regular height of about two inches. Cutting your grass shorter will help prevent matting under leaves and snow. 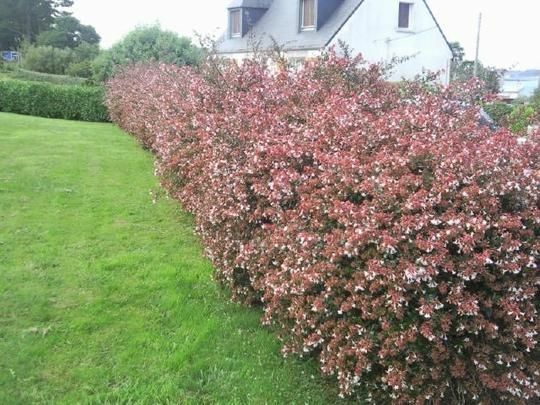 Avoid cutting it too short though, otherwise weeds can take over if the grass thins out too much. Don’t slack on watering just yet. Until temperatures really begin to cool, continue to water your lawn as you have been. A general rule is to give your lawn about an inch to an inch and half of water a week. This will vary depending on where you live, the condition of your soil and the type of grass you have. Check your lawn for thatch – a thick layer of dead organic matter mixed with living plant parts that builds up at the surface of your grass. Over-fertilizing and watering too frequently can cause thatch and lead to disease and insect problems. A dethatcher has powerful blades that pull the thatch to the surface. After using the dethatcher, rake up the thatch debris and compost it. Fall is also a great time to attack those pesky weeds like dandelions, clover and other broadleaf weeds. 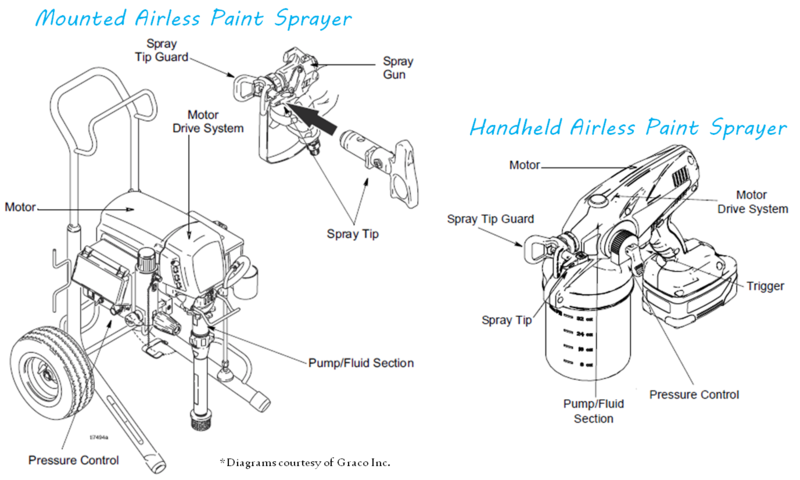 Applying an herbicide spray that contains glyphosate, 2 4-D or MCPP is best. The weeds take these chemicals down into their root system, effectively stopping their chances of returning in the spring. The herbicide needs to be applied when temperatures are more moderate and the soil is moist. Now that you have thatched your lawn and treated for weeds, improve the condition of your soil and grass using these to-do’s. Aerate the soil. This reduces thatch, improves drainage and loosens the soil. Using a plug type aerator is best since there is less chance of compacting the soil. Apply a top dressing. This is a mixture of loam, sand and peat, which will help amend the soil. Put a thin layer over the grass and plug holes. Avoid smothering the grass. Work the top dressing into plugs. Use a stiff brush to push the mixture into the plugs. Repair dead patches in grass. Reseed any thin spots. Use a mulch product that is embedded with seeds and fertilizer to help fill in these areas. Keep spots moist to allow seeds to germinate. If your grass has too many dead patches, try over seeding the entire lawn. Many over-seed warm season grasses with ryegrass to help thicken up thin or patchy yards. Cisco seeds has a variety of different types of seeds available. One is sure to do the trick for your lawn. Sometimes starting from scratch is the best option. Sod is the quickest way to bring your yard back to life. Now that summer heat is on its way out, it is the perfect time to install a new lawn of cool season grass. Keep the new sod moist for a quick start. It will have plenty of time over the winter months to build a strong root system. 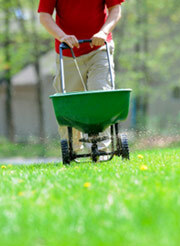 Finish up your yard work by fertilizing your grass. For cool season grasses like bluegrass, fescue and ryegrass, a late summer feeding in September and then again in October/November will help them green up earlier and look better in the spring. Don’t fertilize warm season grasses in the fall because they are dormant. Only fertilize them if they have been over-seeded with ryegrass. You fertilize these types of grasses in the spring. Be sure to remove any fallen leaves from your yard before they can mat down and smother the grass. Using a mulching mower will help with this. 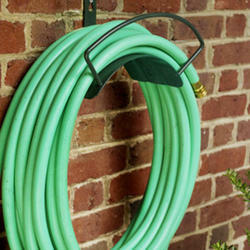 Also, don’t forget to drain your irrigation lines before the first frost. Shut off the water to the system and then drain each zone separately to make sure there is nothing left to freeze. Want more information on fall lawn preparations? Check out our blogs, What Everyone Ought to Know About Lawn Aeration, Aerating/Plugging and Slice Seeding and Essential Fall Tools for Your Lawn & Garden. Our expert staff is always on hand to help you with your yard and garden projects. From detachers and aerators to mulching mowers and over-seeders, if you have any questions about what to choose, pricing or how-to’s, don’t hesitate to contact us. Stop by our store — we’re open seven days a week. Getting Ready for Fall Part 2: Time to Till It Up! The school year is just beginning, summer flowers are dying off and vegetable gardens are winding down. Signs that summer is drawing to a close are everywhere. With fall on our minds, what needs to be done in our yards and gardens before temperatures cool down? Identify plants that are overgrown. They may need to be divided. Check for diseases on your plants. 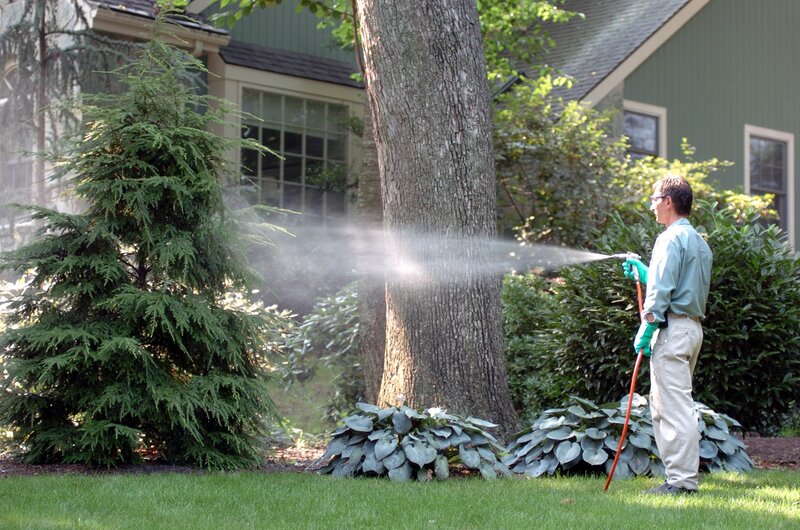 Treat or remove them so they do not infect plants around them. Replace summer annuals. Add fall color with plants like Chrysanthemums. Dig up bulbs. Unearth bulbs that may not be able to survive the winter in your zone and store them. Fertilize turf grass. Add a slow release, all-natural fertilizer to your turf grass. Preparing your garden for next year is easy. The more work you put in now, the easier your task will be in the spring. The key to a successful garden is soil preparation, and fall is the perfect time to do this, since the ground is still warm. Clean up dead plants and remove debris – Make sure you remove weeds so they are not tilled back into the soil where they can spread their seeds. Work compost into the soil – Tilling the compost into the soil helps distribute the nutrients throughout. It will also oxygenate the soil and help keep diseases at bay. Protect the soil – If you aren’t going to plant in this area until next year, cover the ground with straw to protect it from harsh winter weather. 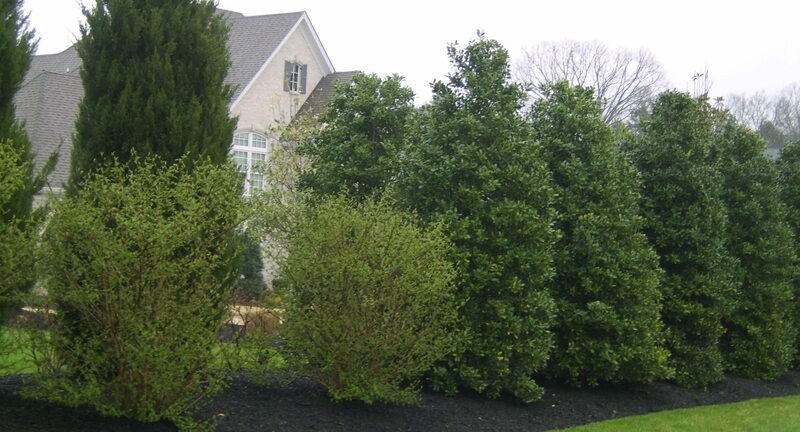 Mulch – If you are planting fall flowers or if you just want to protect your evergreens, then mulch. Mulch will help keep plant roots protected and the soil healthy. Because the ground is warmer in the fall, it is much easier to till deep enough to provide a good medium for root growth in the spring. Tilling is a great way to get your soil ready for next year. It opens up the soil allowing oxygen to reach the deeper layers of the ground. It relieves compaction – plant roots have to work too hard to get through packed soil. It allows for amendments to be distributed through the soil. 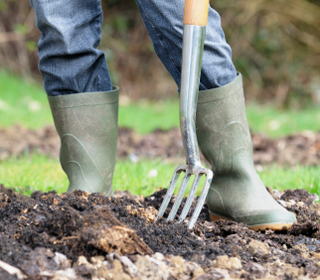 By tilling compost into your soil in the fall, you are giving it all winter and spring to become biologically active. Organic amendments take time to interact with the earth and render their benefits to plants. It can take weeks or months for amended soil to work at peak levels, which is why fall tilling is so much better than waiting until spring. The soil has time to develop. If you are not planting in your garden until spring, rough till your soil in each direction and leave it. The ground will flatten out before spring when you can go back and fine till it. Some of the amendments you can add to your soil now are bone meal (for nitrogen) and rock phosphate (for phosphorous). Add a complete organic fertilizer in pellet or granular form when you till. This is an easy way to add nutrients and will cut down on the amount of compost you need in the spring. For your vegetable gardens, consider letting some of the plants linger. Plants like spent cabbage, kale, cauliflower, Brussel sprouts, broccoli and radishes act as pest magnets. In the spring, these plants release a cyanide compound when decomposing that can kill nuisance pests like wireworms. Just till the decaying plants into the soil before planting next spring. Instant compost! Fall is when you should think about ways to enjoy your garden during the cooler weather. If you enjoy bird watching then leave a few flowering plant stalks in your beds to attract birds. The birds will feast on the seeds and use the stalk as a perch. Remember, garden life is year round and a gardener’s work is never done. Our expert staff is always on hand to help you with your yard and garden projects. From tillers and shovels to wheel barrows and mulch, if you have any questions about what to choose, pricing or how-to’s, don’t hesitate to contact us. Stop by our store — we’re open seven days a week. For part three of our Fall Checklist for Winter 2014, we’re talking mulch: whatever material you cover your flower beds with, we cover mulch basics to help you select which one will work best in your landscape. Mulching keeps weeds at bay, preserves moisture in the soils and adds a finishing touch to any garden bed or landscape. Rock mulch. The most permanent. Rocks won’t fade, wash out, blow away or decompose. It’s an ideal mulch for low maintenance landscapes. Pine straw mulch. Great for hydrangea, azalea and rhododendron beds. Pine straw slowly acidifies soil once it’s laid in place. Cocoa hull mulch. One of the more exotic, cocoa hulls are a byproduct of the chocolate industry, smell great and are good for the soil. One warning, dogs often eat cocoa hulls, which can make them sick. HydroStraw hydro seeding mulch. A new alternative to wood, paper and cellulose mulches. HydroStraw is made in the USA and specially formulated with renewable natural fibers, tackifier and other additives that provide more coverage, more quickly. In addition, you’ll use less water. How do you apply mulch? Start by spreading mulch by hand in between plants, using a rake in more open areas, then layer mulch at least two to three inches deep. For every 100 square feet of area, that equates to about 10 to 12 bags of wood mulch. Welcome to our Fall Checklist for Winter 2014! While fall weather is still crisp but cool – and the ground is not yet frozen – we’re going to help you tackle cleaning up your garden. Step 1. 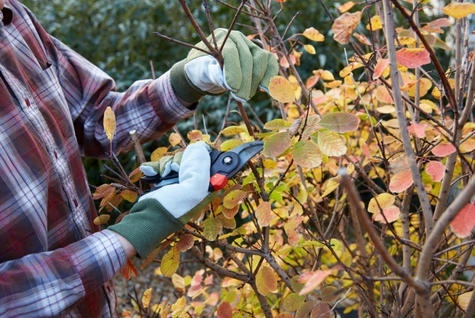 In addition to removing spent blooms and shriveled leaves, cut back, break up and remove any foliage that looks diseased. How do you spot foliage that’s been attacked by disease? Look for bugs, leaves that are eaten away as opposed to succumbing to fall color or lint-like growth and coatings on stems and foliage. Cutting out any disease, or the entire plant, will prevent the offending condition from staying viable, known as “overwintering,” and making it less likely to attack in the spring. Step 2. During a dry fall, water trees, shrubs and especially evergreens deeply, so they stay hydrated during the dormant winter season. Step 3. Amend the soil in your garden beds by spreading them with a couple of inches of organic compost, which breaks down over the winter to reveal healthy, nutrient-rich planting material when the snow melts. This is especially effective for sand or clay soils. Step 4. Apply a layer of mulch to perennial plants, after the soil freezes and daytime temperatures dip below 32 degrees. The winter mulch protects them from chilly air, fast freezes, wind and weather. 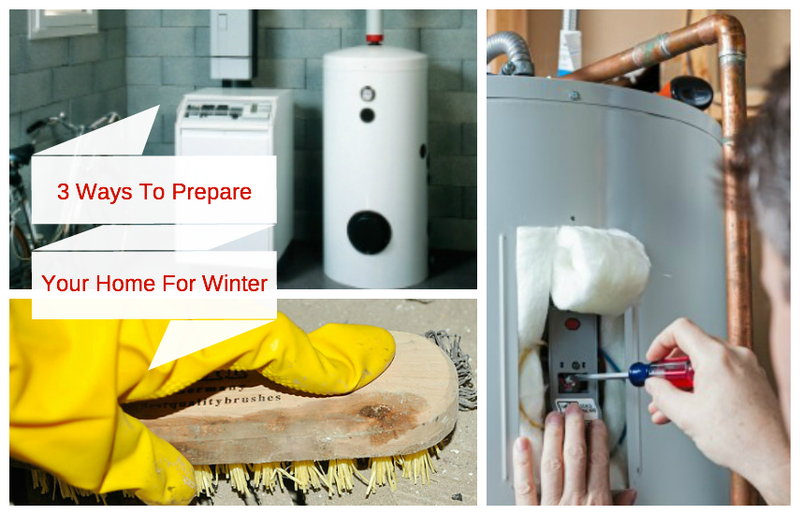 Getting your home ready for winter’s weather is a priority for most homeowners, especially in the fall, before the cold stuff starts to fly. We’ve put together three more ways to protect your home and property – then you can cross “winterizing” off your to-do list. Don’t delay! In addition to preparing your home to keep heat in for the winter (consider linking to part 1 of this blog series), keeping your furnace and other heating equipment clean and in good running condition, helps ensure proper heat output, reducing energy use and heating costs. Check if your utility company offers free or discounted annual checkups of your home’s heating system by qualified technicians, and call early to avoid the rush. Another resource to try is furnace manufacturers or dealers that offer free or discounted inspections. If your furnace needs a new part, by all means get it replaced now – it will not only save your money, but perhaps a little heartache, if the furnace decides to poop out during a winter storm. Plus it’s a lot more cost efficient to replace a part rather than replace the entire furnace. Consider upgrading to a new energy efficient furnace to not only save money, but also increase the value of your home. Typically you’ll save 50% or more and you could qualify for federal tax credit. Clean or replace furnace filters now before the heating season begins and once a month during the heating season. A regular filter maintenance schedule can help increase the need for more energy due to dirty filters, which restrict the airflow. Switching to a permanent or HEPA filter can reduce waste and keep the spread of illness-causing bacteria, mold, viruses and pollen in check. While you’re at it … if you have ceiling fans installed in the house, get out the ladder and switch the direction of the blades to winter mode, or a clockwise direction, which moves warm air near the ceiling down through the living space. As with any other main system in your house, doing a check-up on your water heater before the winter season can save you time, money and frustration. Turn down the water heater from the factory – set 140 degrees F to 120 degrees or lower, reducing energy costs and preventing any potential scalding or water burns. Flush the tank by turning off power from the fuse box and turning the thermostat to “pilot.” Turn off the cold water supply and attach a hose to the valve drain at the bottom of the heater, running the hose to a bucket or trough. Open the drain value and allow water to flow for five to seven minutes. Let the water stand in the bucket and check for mineral deposits. Continue draining until the water is clear, adding cold water to the heater, if needed. Unhook the hose, close the drain valve, turn on the water supply and let the tank re-fill. Remember to bleed air by opening up the hot water faucet in the house. Once the water is hot, it’s safe to turn the power back on from the fuse box. Replacing a tanked water heater with a tankless water heater can save you this step, save money, and can also qualify you for a tax credit. Whether you have a fuel-burning stove or an insert, make sure your fireplace is in running condition. Examine the doors and gaskets of the wood stove or fireplace insert for a tight seal. Have the chimney cleaned by a professional chimney sweep. Buy wood or fuel in bulk, a supply for at least half of the winter season, if not more. 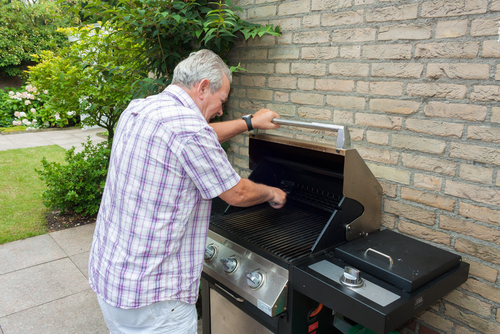 Check grates for damage and replace if needed. Check the pilot and natural gas supply on inserts. While you’re at it … get out those sweaters and dress warmer for the colder weather. “Personal heaters” such as fleece vests and jackets, long-sleeved shirts and cozy wool or cotton sweaters can add up to four degrees of warmth directly where it’s needed. Who knew? 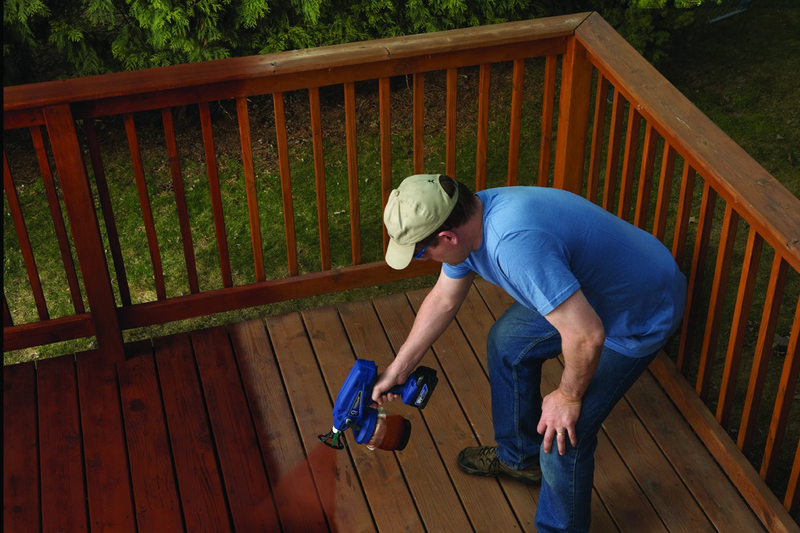 Our expert staff is always on hand to help you plan your next winterizing project. From heaters to hoses and everything in-between, if you have any questions about what to choose, pricing or how-tos, don’t hesitate to contact us. Stop by our store — we’re open seven days a week. You have a beautiful, healthy lawn and you work hard to keep it that way — mowing, watering and fertilizing as part of a regular maintenance schedule. But lately, you notice that your lawn looks a little lack-luster. It was established back when your home was new, and it’s been a good number of years since then. Perhaps the homebuilder used sod, and now the soil is layered, which disrupts natural water drainage and leads to poor root development. Plus, your kids and pets are running around on it all the time, compacting the soil underneath the grass roots, and now it dries out quickly or feels sort of spongy. This indicates your lawn may have too much thatch that’s inhibiting the proper health of your beautiful lawn. For all these reasons, aerating your lawn can help keep it beautiful. The best time for aeration is during the growing season in early fall, so grass can heal or fill in any open areas before it goes dormant in winter. If you aerate your lawn and fertilize it at the same time, it can help the lawn breathe more easily. To learn more about this combination, read our blog post, Mark an Item Off Your Fall Checklist – Aerating and Fertilizing. Spike Aerator: pokes holes through the grass, thatch and roots and into the ground with a solid tine, or fork. This method is the least effective for soil compaction. 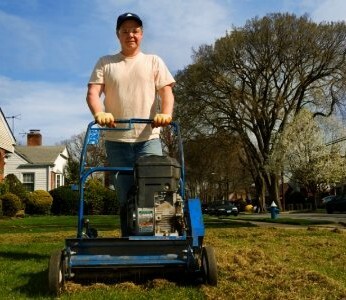 Aerator/Plugger: removes a patch of grass and soil from the lawn, called a plug. This method can achieve fantastic results with regard to soil compaction. Slice Seeder: cuts vertically through existing grass and thatch, into the soil, dropping seed in the rows cut behind. Slice seeding makes direct contact with the soil for the seed to germinate quickly. The technique literally slices into the soil, creating rows for the seed to fall into, all in one motion. 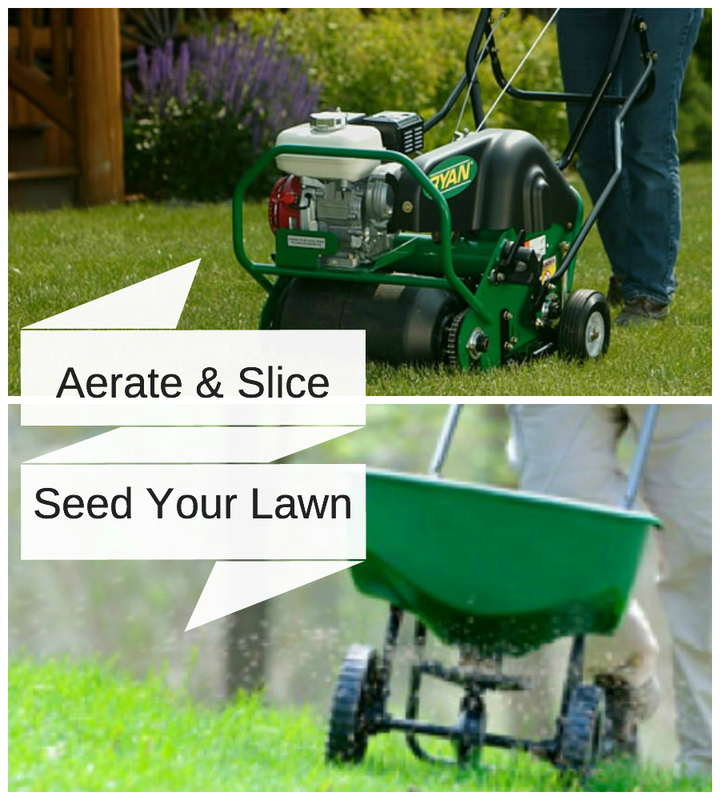 To learn more, read our blog post, Improve Your Existing Turf with Slice Seeding. Our expert staff is always on hand to help you make aeration part of your yearly lawn care regime. From aerator/pluggers to slice seeders to fertilizer, if you have any questions about what to choose, pricing or how-tos, don’t hesitate to contact us. Stop by our store — we’re open seven days a week. 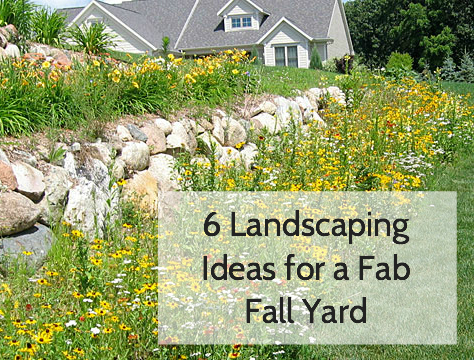 Plus, your beautiful lawn will thank you for helping it breathe again!